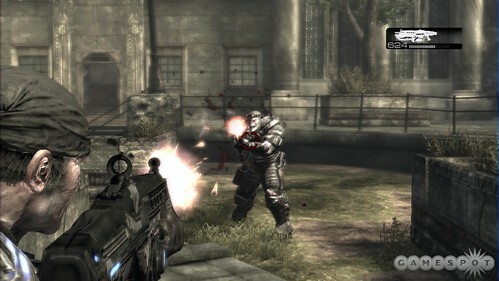 I was playing a round of Gears of War, trying to redo a level on "insane" mode, and the walls were painted with guts. I slaughtered my way to the boss, revved up my chainsaw, and sliced into his chest -- releasing a fractal fountain of gore. Woo! At that instant, I heard the front door to my apartment open, and in walked my nanny... with my 15-month-old son, his eyes agog. Daddy, I could see him thinking, what are you doing? Oh, nothing, son. Just kicking back with a mass-murder simulator. That's all! So I hastily clicked off my Xbox 360, and avoided the nanny's eyes. But it got me thinking: Eventually he's going to want to play video games. And then I'll have to face the traditional child-rearing quandaries that games present. When will I hand him his first controller? Will I let him play the gory combat games I love so much -- and, if so, when? I've already had plenty of moments like this when I hear my kids coming downstairs after they are suppose to be in bed and I'm in the middle of "Tom Clancy's Ghost Recon Warfighter" or a heated round of "Fights Night Round 3," EA's marvelous, but brutally violent, boxing game. I always quickly pause such games and switch over to something else when the kids come in. But, like Thompson, I'm always wondering when I'll let my kids play some of these games with me, or at least let them watch me play them. I already let them watch me play certain games like "Test Drive" (an amazing racing game) or "Tiger Woods Golf." They seem to enjoy those games and my son sometimes even runs to grab a controller and asks me to play "Daddy's car game" since he loves that one in particular. But I never let them watch any games with violent themes or bloody action. Basically I've adopted an informal household media rule that Thompson discusses in his essay: Treat games as if they were movies and don't let you're kids watch anything you wouldn't also restrict them from viewing if it was movie content. Thankfully, if you're not already fully aware of what you can expect to see or hear in a game, the industry's outstanding ESRB ratings system makes it abundantly clear on the back of every box with detailed ratings and content descriptors. Thompson's essay hits another part of the solution (especially for older kids) when he notes that: "The obvious solution is to strictly limit game-time, and simply endure the whining for more. Most gamer parents told me they don't allow more than an hour a day, and some only allow gaming only on weekends." Generally speaking, that's an excellent approach for parents to adopt for many types of media content. In my upcoming booklet on "Parental Controls and Online Child Protection: A Survey of Tools and Methods," I argue that almost all parents adopt a variety of informal household media rules to govern their children's media consumption. For example, a 2003 Kaiser Family Foundation survey found that â€œAlmost all parents say they have some type of rules about their childrenâ€™s use of media,â€ including video games. (3) "Under what conditions" rules - which are any conditional (i.e., "carrot-and-stick") rules that parents use to incentivize their kids to accomplish something else (i.e., homework, better grades, chores, etc.) before more gaming is allowed. Of course, these informal household rules are great, but they don't answer the question Thompson and I are pondering regarding when to let out kids start playing games, especially games that include some violent content. Again, I think common sense dictates that just as we would not let our 6 year olds watch "Natural Born Killers" or "Sin City," we would also not allow them to watch or play "Grand Theft Auto" (GTA) or "Resident Evil 4" (RE4). But figuring out when the time is right to let kids play more mature games remains a very difficult question. What about games with very mild or moderate levels of violence, like certain Star Wars games, for example? Or even that boxing game mentioned above? I've already started having discussions with my kids about separating fantasy from reality in other things they see of hear, be it on television, in movies, in books or whatever else. Sooner or later I'll be having that same discussion with them about video games too. But that doesn't mean I'll be letting them play GTA or RE4 any time soon!